This Advance Tabco PLD-3018 Prestige series 18" five-tiered stainless steel liquor display rack is part of a complete lineup of upscale underbar equipment. Items found within the Prestige series of underbar equipment line up perfectly with each other, creating a uniform look across any bar. In addition to a number of eye-catching features, this item boasts an exclusive twist-action leg assembly for added strength and an extended 7" backsplash and a rear deck to create a truly one-of-a-kind unit. This liquor display rack features a five-tiered design that perfectly displays your bottles of commonly used liquors to draw in customers and allow your employees to easily see which bottle is which. Steel straps hold the bottles securely in place so they will not fall or tip, and the entire unit is sound deadened so that you can use it even during peak business hours without worrying about extra noise. 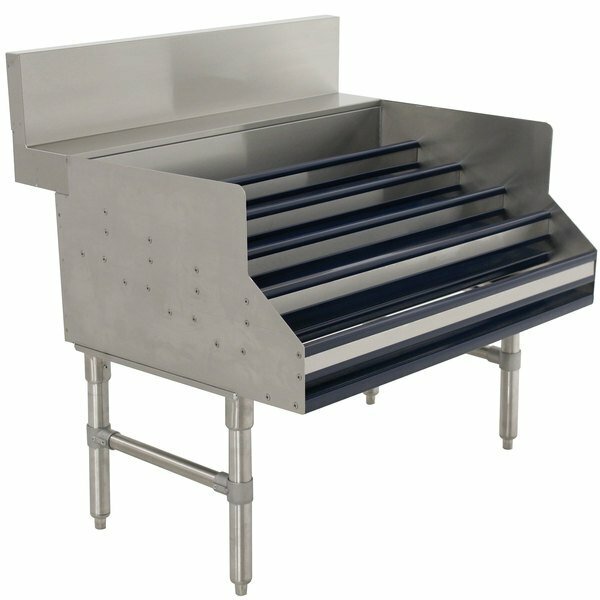 The entire unit is made of durable 20 gauge, 300 series stainless steel for ease of cleaning and long-lasting performance. Its 1 5/8" legs are made with 18 gauge stainless steel and come equipped with 1" adjustable plastic bullet feet to protect your floor and also account for any unevenness.